Pardon me if this has already been discussed, but I haven't found it. I deleted a couple of characters, but their inventories are still listed in the II tooltips. How do I get rid of their data? I searched the savedvariables file (..\SavedVariables\IIfA.lua, right?) for the character names but not found. This should remove any data that's not owned by you anymore. If it doesn't, that means the game client still thinks those characters exist for some reason. It's normally called when you delete character data in game and when you first load a character. No idea why it wouldn't have worked properly. You can't find the data because it's stored by character ID, not character name. In hindsight, I did not delete the characters. The characters I refer to were on the PTS, and were wiped by PTS updates or when version testing completed. My characters from the last few DLC/Chapters are still listed. I suppose I should delete the savedvariables and relog everybody. I deleted the savedvariables file and logged in the game. 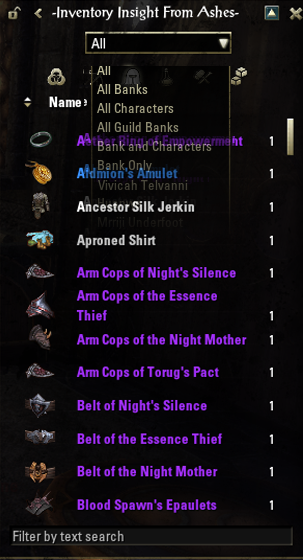 I must have another Addon that shows all characters inventories in the tooltips. Now I have two character inventory listings in the tooltips; the one for II (which I must have disabled previously) is correct. The other listing is the one with the nonexistent character listings. Now I have to find which Addon is doing that. Also, after I did the above operation I found that there is a Manage collected data section in the Addon settings, including "Ignore or delete characters". It is CraftStore that is adding the other inventory quantities. Edit 3: I remember why I had disabled the II tooltip inventory display and left the CraftStore tooltip: The II tooltip takes up lots more vertical space then CraftStore's since it is arranged in a single column, whereas CraftStore's is a single line separated by commas. 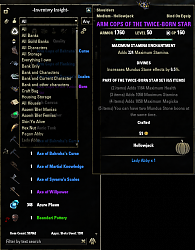 However, CraftStore's display of quantities is confusing because it is inconsistent in adding up different types of an item, such as standard Crown items compared to Crown items that are convertible to Crown Gems. 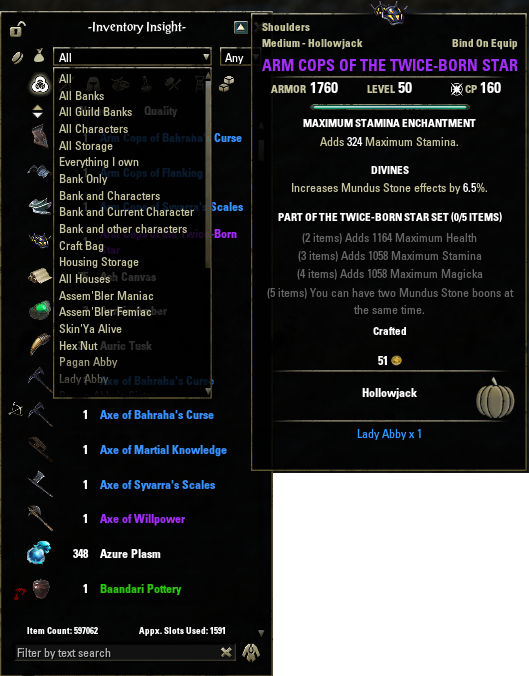 Or bound/unbound items compared to character bound items. I kept the CS display in the past but I think I must settle for the space-eating II version because it is easier to use in figuring total quantities. It would be nice to see the II tooltip changed to the CS single line style. Just a thought. Last edited by Jaim Sandar : 04/25/19 at 10:39 AM.